Sea Urchins live in cool to temperate seas and are a popular food in the Mediterranean, the Americas, Japan, New Zealand and Korea. These creatures are globular with tiny spines – tubular feet which pump water in order to walk. These spines also protect urchins from predators, they are not harmful to humans, but can be quite painful if you step on them and get them stuck in your feet. Erizos de Mar (Spanish) or Ricci di Mare (Italian) can be found on the sea bed from depths of about 15 feet – you have to dive for them. Thick gloves or a special tool are required to pull them off the rocks (they are quite spiky) – purple, green and brown urchins are considered to be the best ones to eat. Keep the urchins fresh in some sea water, or if you are buying them in a shop or market, eat them the same day – they go off quickly. The fishing season goes from October to May. In most countries the urchin roe or coral (actually the gonads) are eaten raw. 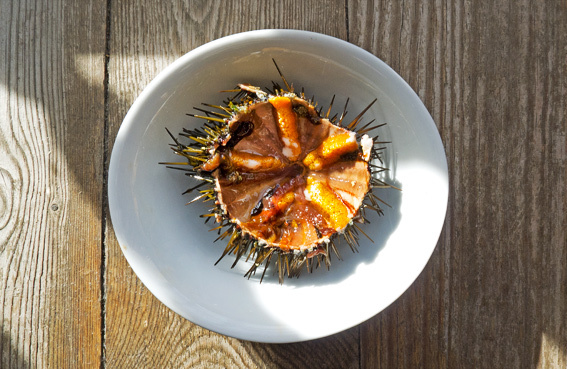 In Japan the uni (urchin) is served as sushi or sashimi, while in Europe they are eaten straight from their shells or with scrambled eggs, pasta and even in a gratin. To open the sea urchin shell, wrap a towel around it or wear some stout gloves. Cut across the shell from the mouth end with a sharp knife or a scissors/nut cracker like implement specially designed for the job. The one above was opened with a knife. Remove all the gooey black stuff with a spoon – it’s the orange roes that are edible. Eat them as they are or with a little squeeze of lemon. 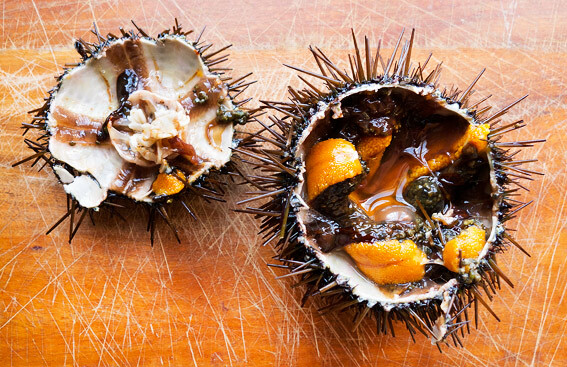 Sea Urchins taste of the sea and have a slightly sweet, foamy, buttery texture. The taste goes well with a crisp dry white wine such as a Sancerre. In London you can find Sea Urchins in Borough Market, Atari-ya, Billingsgate and possibly, Harrods Food Hall, Steve Hatt and other good fish mongers. It’s normal to see them in Mediterranean fish markets (like the Boqueria in Barcelona) when in season. 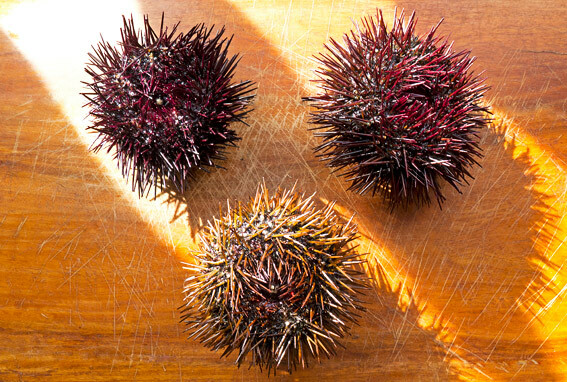 Sea Urchins are reassuringly expensive – expect to pay 8.50€ per kilo for small ones (the price increases with the size). See here for a look at commercial preparation. This entry was posted in Barcelona, Fish, Food, Shopping, Spanish and tagged Atari-ya, Borough Market, coral, Erizos de Mar, gonads, La Boqueria, Mediterranean, roe, Sea Urchin, sushi. Bookmark the permalink. They grill these on the docks in Senegal. It is. You buy a large mounded platter and then you compete with the Asian sailors for a place at one of the long wooden tables. The waiters will fetch cold white wine from a nearby hotel if requested. I bet they are cheap too! I’ve always wanted to try these, never seen them for sale in devon though. Wow, urchins are expensive down there! Free here, save for a bit of paddling or snorkelling, but I’m building up to trying them. One of the few seashore offerings I’ve not eaten. I’ve dissected plenty for undergraduate zoology labs, so I’ve no excuse regarding prep! Thanks for the inspiration to try some. They are like creamy oysters. If you like shellfish you’ll love urchins! Great post MD. they are free here too but, I would not trust anything from the shore near Dublin. Sea urchins are plentiful in Greece. I can remember my aunt constantly snacking on whatever she found, sea urchins being her favourite. Mad Dog: You are a brave man. I’ve enjoyed them in restaurants, but I think I’ll leave it at that. I’ve always wanted to try sea urchin. Next time I see them on a menu, I will most likely order them :). Agree with Celi: even opening them can lead to painful problems! BUT what a wonderful taste . . . oh, love paua too . . . and thanks for the ‘lesson’ 🙂 ! Ouch, I bet that hurt! Love sea urchin, raw though. I have tried the gazillion cooked preparations here, and I find that it loses that wonderful “taste of the ocean” quality and becomes very, very strong! Beautiful pictures Craig!!! I’ve never tried sea urchin.. isn’t it available in sushi as well? I think I’ve seen it offered at a sushi place near us. What an exotic dish.. and flavour! I love sea urchins, great to read about them. But blimey, they’re expensive in London! Haven’t had them for ages, scoffed lots very cheaply years ago by the sea in Morocco. And had an equally memorable, if less pleasurable, experience treading on one too. Can verify they do hurt a bit.